Notes: Six crossing of an elevated railway utilizing guided boring and pipe ramming. Spacing was 2-2.5m center to center. Notes: Original design called for twin 450mm x 140m HDD. 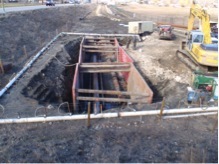 Project was completed using a guided boring and pipe ramming combination to minimize the potential negative environmental impact. It is to date the longest completed guided boring project in Canada. 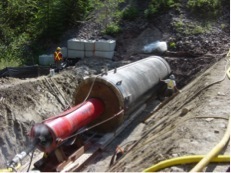 Notes: Project was a single culvert that was completed using Kamloops Angering’s owned 32” (Apollo) pneumatic hammer. Notes: Designed for one 500mm x 101m on grade (.25 %) sanitary casing. 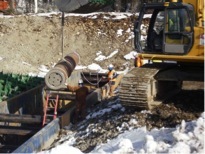 Project was completed using a guided boring and pipe ramming combination to minimize the potential negative environmental impact. 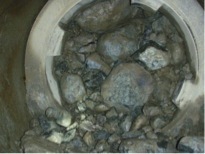 Invert depth of 5m s in the middle of a busy downtown street that required an extensive dewatering program. Notes: Installation water intake casing from shore 85m x 750mm m on – 12% grade. 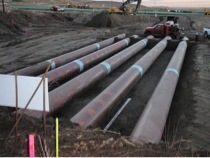 Project was completed using pipe ramming to minimize the potential negative environmental impact. Divers confirmed exit elevations and completed intake mechanical. Notes: Pipeline slipbores utilizing guided boring and pipe ramming in saturated running sand.